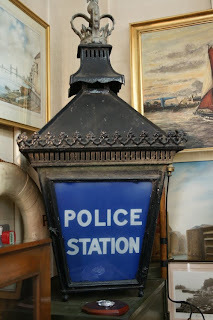 Among the collection in the Thames River Police Museum is a rather fine blue lamp. These are hung in front of police stations, one of those features of English life we take for granted. When, though, did this practice begin? Blue lamps appeared outside London police stations in 1861. They would spread throughout not only Britain but also the empire: Bahamian police stations, for example, still have these lamps today. There seems to be some uncertainty as to why the light is blue. Probably it was chosen to match the colour of police uniforms, themselves selected because blue was a fairly neutral colour and clearly distinct from the red of the military. However, it wasn't popular with everyone: apparently, Queen Victorian objected to the lamp outside Bow Street Police Station. Every time she went to the nearby opera house in Covent Garden, it reminded her of the blue room in which Prince Albert had died. Bow Street was therefore unusual in having a white lamp. 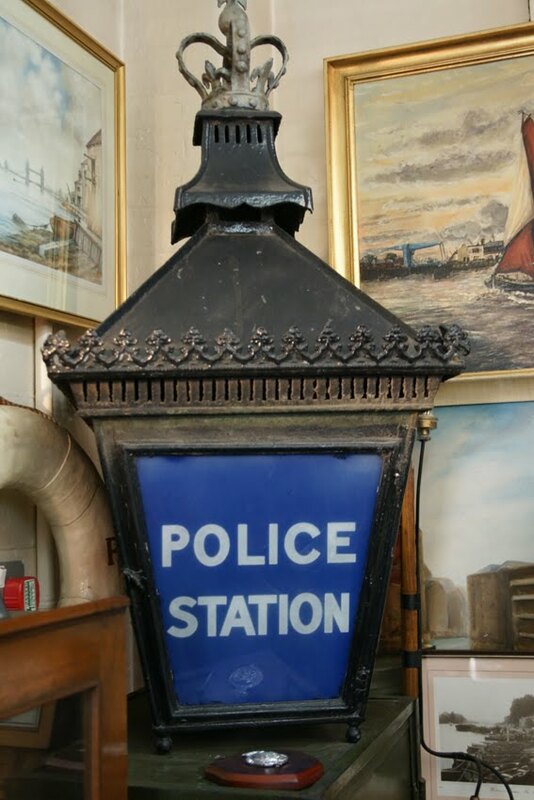 Whatever its origins, the blue lamp became a symbol of British policing and in particular of its positive features. Dixon of Dock Green gave his monologues under this light; he had made his first appearance in a 1950 Ealing Studios film titled The Blue Lamp . However, with station closures and greater scepticism about policing, will the blue lamp continue to maintain its symbolic status? Two adverts have been painted on the same spot, both in black lettering, which makes them rather difficult to decipher. One appears to be headed 'Off-licence' with the words 'beer', 'wines' and perhaps 'spirits' arranged diagonally underneath. 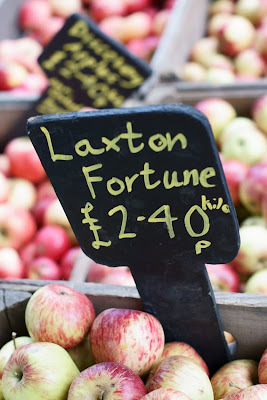 The other has 'agents,' alongside the heading 'Fox & Sons'. Below that is 'nborough', all that remains of 'Farnborough', then 'Ales Stout' and finally 'In bottle and cask'. It seems clear, then, that there was an off-licence here for some time. The 'Fox & Sons' of 'nborough' was more mysterious, so huge thanks to Brian for solving that mystery. He included a link to some great pictures of the brewery and one of their advertisements. The Farnborough in question is not the Hampshire town but a former village near Orpington, now part of the London Borough of Bromley. Fox & Sons were located in Green Street Green. They opened their brewery in 1836 and by the middle of the century were successful enough to build housing for their employees in nearby streets. The brewery closed in 1909 and would later be used as barracks in the First World War. 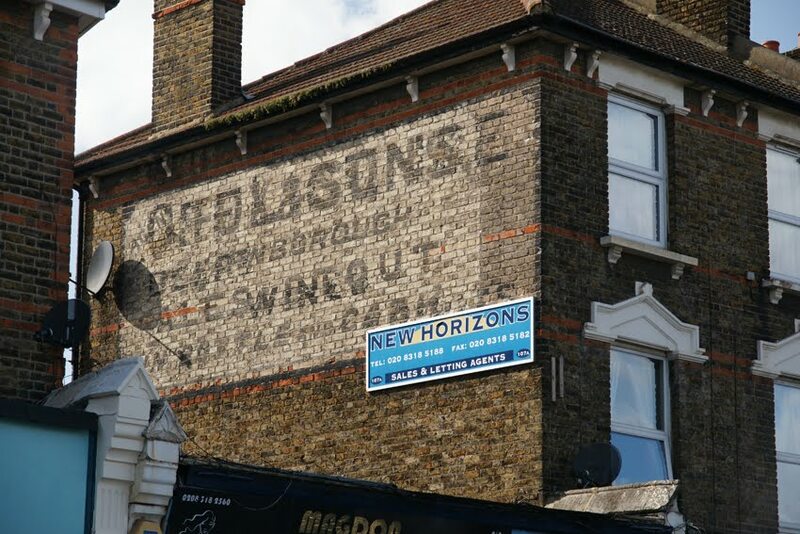 That history suggests a very early date for this Hither Green ghost sign. Any frustration at its being so worn is replaced by admiration for its surviving at all! I've previously discussed facadism, one type of 'conservation' which maintains the facade while losing the original structure behind. 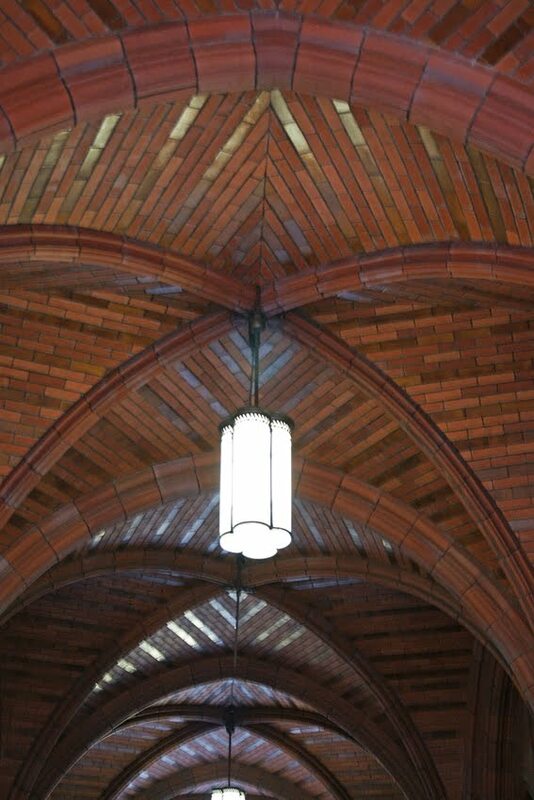 Here is another piece of preservation which loses some of the original context. 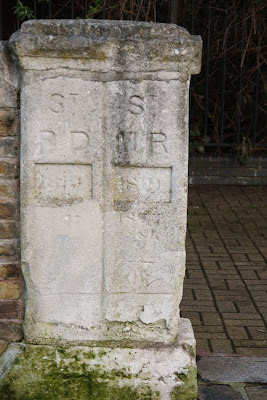 This parish marker on the Thames path marks the boundary between St Paul's, Deptford and St Mary, Rotherhithe. It was also the line between Kent and Surrey. I particularly like the economy of adding dates below the original one, rather than replacing the markers. However, the stone has been moved from its original site, where it formed part of a bridge; it was put in its present position in 1988. That seems a strange fate for something whose precise location was so important. The small length of wall mid-path is also rather incongruous. That is perhaps a little grudging, though. The most important factor is that when the bridge went, the stone was not discarded but remains beside the river as a tangible survivor from Deptford's (and Rotherhithe's) past. 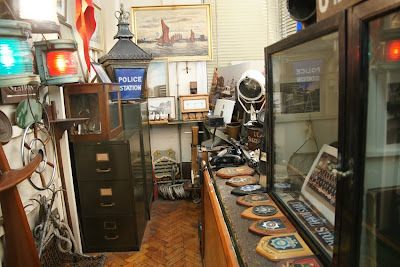 Just the sort of place one hopes to discover during Open House, the Thames River Police Museum is a true gem. Usually open only by appointment, it is housed in the former carpenters' shop of the police station on Wapping High Street. 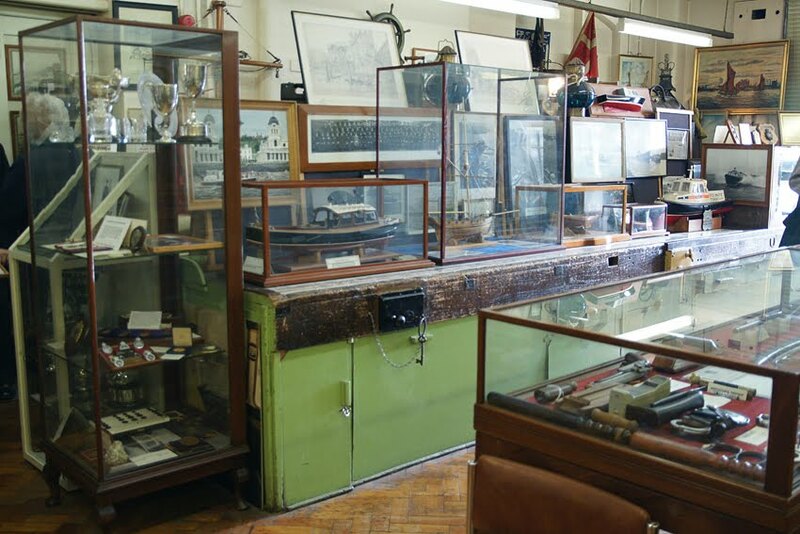 This one room is absolutely crammed with display cases, items hanging on the walls, and objects tucked into every available space. Such a surfeit of exhibits is perhaps unsurprising when they are documenting the oldest police force in the world: it predates the London Metropolitan force by over 30 years. There are discoveries to be made at every point. From a fingerprinting kit to the flag of the tragic Princess Alice, gluepots and trophies, uniforms and cell door locks, handcuffs and weapons, every aspect of the force's history is commemorated here. While we were free to make serendipitous finds, the incredibly knowledgeable and friendly volunteers really made the visit special. 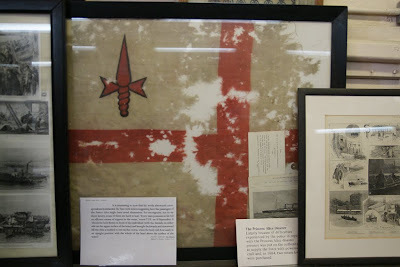 They were all enthusiastic about the extraordinary history of the river police. One of the River Police's first big challenges was a riot outside the station doors just four months after the force was founded. Until 1800, the force was funded privately by shipowners concerned at the amount of crime on the river. Much cargo disappeared as the boats were unloaded: while to the 'lumpers' this was a perk of the job, the shipowners considered it theft. The new police force shared the latter view. When three men were each fined forty shillings at the Thames Magistrates' Office for coal theft, their friends decided to get the money back and gathered at the police station. Missiles were thrown, there were threats to burn the building and its occupants, and when a rock smashed through the window an officer fired out into the crowd and killed a rioter. Reading the Riot Act failed to calm the situation, and a police employee was fatally shot. The identity of the shooter was never discovered but James Eyers, brother of one of the fined men, was hanged for murder on the basis that he had instigated the riot. These turbulent beginnings are in sharp contrast to the better-known story of Sir Robert Peel's force founded some decades later. Indeed, although the river police were merged into the Met in 1839 as the Thames Division, they have retained their own identity and continue to be proud of their status as oldest professional police force. 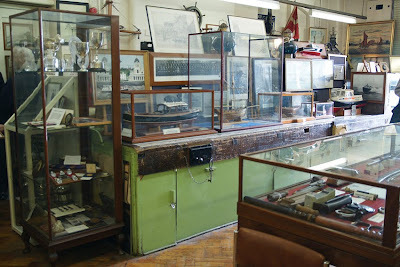 Further reading: the Museum's history pages are well worth a visit. Deptford X begins tomorrow! This annual art festival has a full programme of exhibitions and events - and like all good festivals, even has its own fringe. 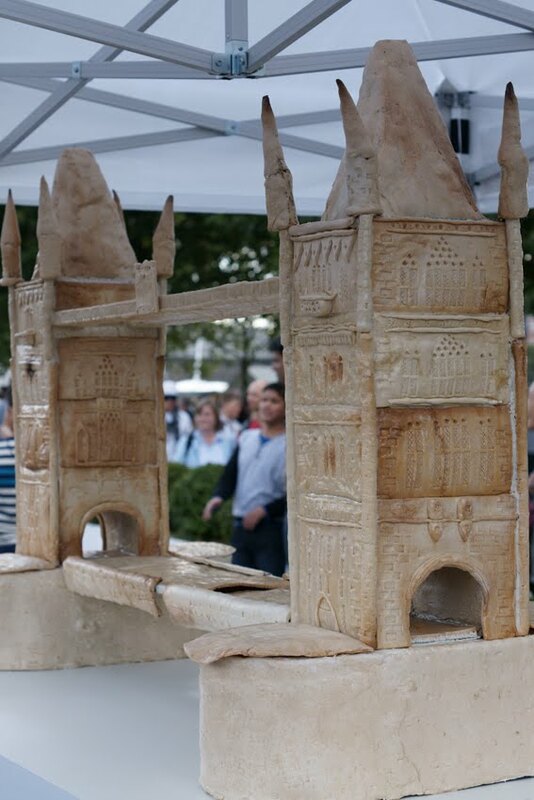 Outside the Birds Nest pub will be a contemporary version of the Deptford coat of arms; there's a special Deptford Biscuit depicting the Golden Hinde; while for all would-be insects, The Fly lets you move your silhouette over 'a pulsating flesh landscape'. Oversized bird feeders will appear in Sue Godfrey Nature Park and there are plenty of other shows including several using objects found around Deptford and its market. In the market itself, Douglas Way will get its new mural. For all the details - and there really is a great deal more happening than I've mentioned - click here. An extravagant, enormous piece of Victoriana, the Prudential Building sits at the eastern end of High Holborn. While Prudence stands on the facade holding her mirror, there is little evidence of prudent restraint elsewhere in the building. 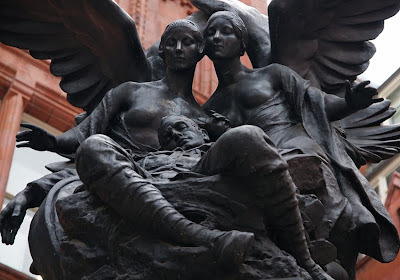 While my exploration of the courtyards with their fine war memorials was curtailed by heavy rain, the interior was generously open for us to wander at will. 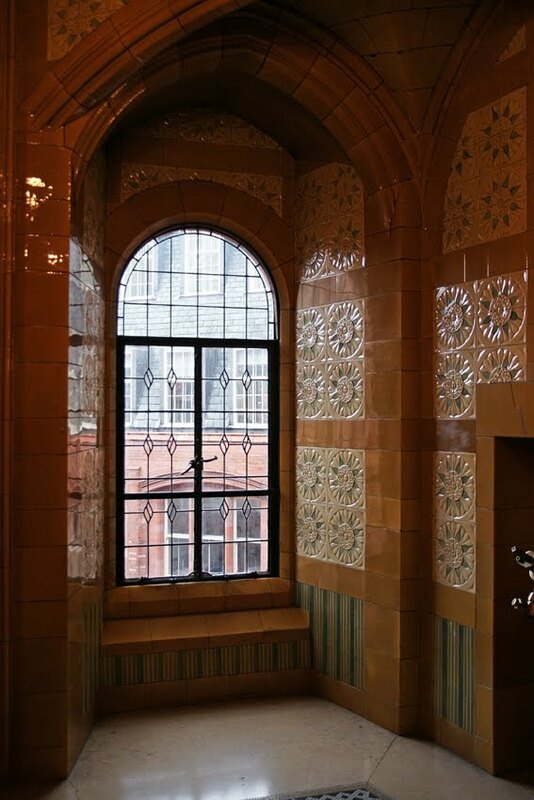 Now a corporate venue known officially as Holborn Bars, the building retains many magnificent original features from the exuberant tiling to the vast and imposing safe doors. These once led into the muniment room where deeds and securities were stored. If all of this seems excessive, ponder the incredible fact that in 1905, one-third of the population was insured by the Pru. Our walk through Margaret McMillan Park with architects BDP continued into Douglas Way, the part of Deptford Market which has been revamped under the same project. Here, the key challenges were both budgetary and legal. The first speaks for itself; the second relates to the rights of stallholders. The architects had a vision of the market extending the full length of Douglas Way. Unfortunately the stall agreements relate to specific locations, so the stallholders were entitled to insist on their original pitches. That made moving the second-hand market, which was in the square beside the Albany Theatre, almost impossible. However, the matter resolved itself when the square was closed for resurfacing and infrastructure works. The stallholders preferred their temporary pitches along Douglas Way and chose not to move back. The square is therefore free for new uses: ideas include a food court. It also now has infrastructure such as electrical points which make a wide variety of events, such as concerts, possible outside market hours. Parts of the area are paved with granite, but there is also a lot of tarmac. The reason for this does seem to have been financial. However, I was surprised to hear that my least favourite aspect of this compromise design - the markings painted on the square - was a deliberate decision. Rather than the usual small corner marks to show pitch locations, the architects chose more obvious, colourful painted lines which were meant to evoke a barcode. The contractors had to be convinced that the lines were intentional, and I'm not surprised. It's not to my taste: rather than barcodes, they evoke a very ugly car park! Once again, a lot of street furniture was removed to make the space more open and welcoming. 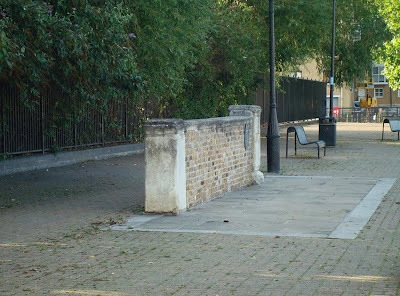 Granite seats and trees were added in the square; the old mural was rendered over in preparation for a new design to be painted during Deptford X. The lighting hangs on wires rather than being supported by posts, again making the square a less cluttered, more flexible area. 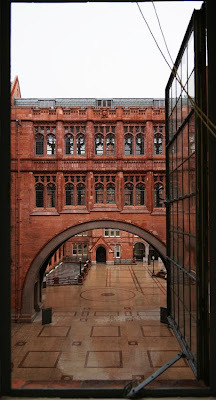 Differences of taste aside, it was helpful to hear the architects' vision for the market area. 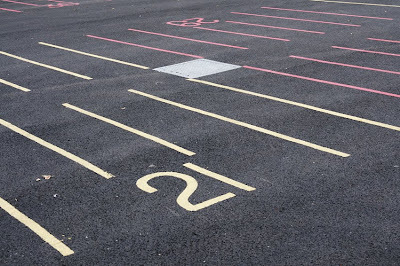 It will be interesting to see whether the hoped-for developments in usage occur, and how well the new granite and painted tarmac age. At the moment, the square remains a rather empty place and it may require further effort from the Council to change that. More positively, the number of market stalls has apparently increased since the changes so there are grounds for optimism. When steamships began carrying cargoes to London, they really needed larger, deeper facilities than the Pool of London could offer. The result was a vast, state-of-the-art dock further east on Plaistow Marshes: the Victoria Dock. This was the first built specifically for steam vessels. The result was impressive: opening in 1855, the dock had five jetties providing nearly three miles of quays. 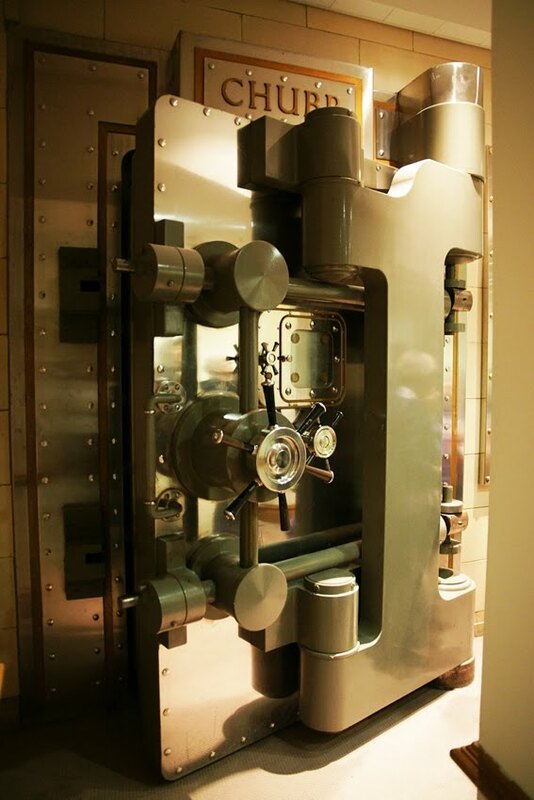 Its entrance lock was over 24 metres wide and, thanks to hydraulic machinery, could open in a minute and a half. 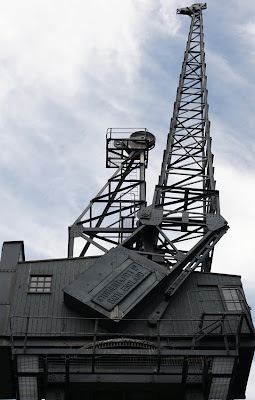 Warehouses and cranes lined the edges; originally, many were specially adapted to handle either meat or tobacco. Later, the dock dealt with a great deal of fruit and had specific facilities for some such as bananas; it was also a centre of flour milling. Such had been its success that the Albert Dock was added in 1880, and both were given the prefix 'Royal'. There were also bad times here: the worst was the Silvertown Explosion of 1917. A TNT factory exploded, destroying a large area and killing 73 people. The cause was uncertain, but there was strong criticism of such a dangerous industry being carried on in a built-up area. In 1981 the dock closed. Once at the forefront of dockyards' moving further east, it now fell victim to the same process as vast container ships used the even larger facilities of Tilbury. The Royal Victoria became a residential and leisure space, with one side occupied by the huge Excel exhibition centre. 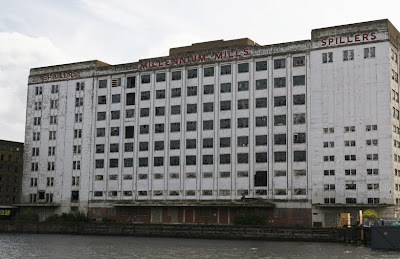 The Millennium Mills are a solitary, near-derelict reminder of the industrial buildings once all around; they are now rather incongruous among the shiny new flats and newer construction. 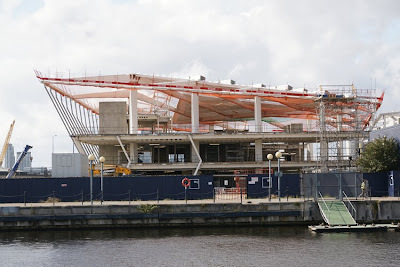 The cable car across the Thames will terminate at one corner of the Dock; nearby, the Siemens Sustainability Pavilion is being built. Our boat tour of the dock was part of a project which aims to reconnect local people with the docks. The River Princess is owned by a charity who plan to use it to provide training for those who want to work on the water as well as educational trips. These will allow people, especially school groups, to see the natural and built history of this fascinating area of London. As the park is literally on my doorstep, I had a gentle start to Open House weekend. Margaret McMillan Park was transformed last year; today I'd hear from the architects, BDP, about the process behind that transformation. Any concerns that a tour of somewhere I already know well might be dull were unfounded. The insight into the design background was genuinely interesting. Leading from New Cross Station to the market and the Albany Theatre on Douglas Way, the park doubles as a significant thoroughfare for pedestrians and cyclists. However, consultation had indicated that many local people found it uninviting: it was overgrown, run down, and felt unsafe. The brief, then, was to transform the old park into something more inviting. The project was made more challenging by a tight timescale, just nine months from commission to completion. In this time, almost all of the existing park was ripped out (most trees were kept, however) and replaced with an entirely new design. To encourage people to enter the park - and realise that it even is a park - two key changes were made. First, a straight, wide path leads through so its role as a route between High Street and station is clear. Second, large shrubs, hedges, fences and so on were removed so that the area is opened out. Borders are marked by low granite benches rather than high, overgrown hedges; the playground is a natural part of the park rather than a separate, fenced-off section. So that people might linger, the architects included both granite and wooden benches, and some picnic tables. During consultation, residents were actually dubious of these (and I wouldn't have disagreed) but in fact, they work well. The park is used by more, and more diverse, people than used to be the case. Our tour guide was particularly pleased that many locals buy lunch at the market and eat it here - so much so that extra bins had to be added soon after the park opened. The park's most distinctive feature is its vertical posts. These are of treated oak, set into concrete, and designed both to give the park its own identity and to divide it into 'rooms'. (I'm not sure about the latter...) Although a lot of people expressed concern about how well they would survive, they are proving durable. 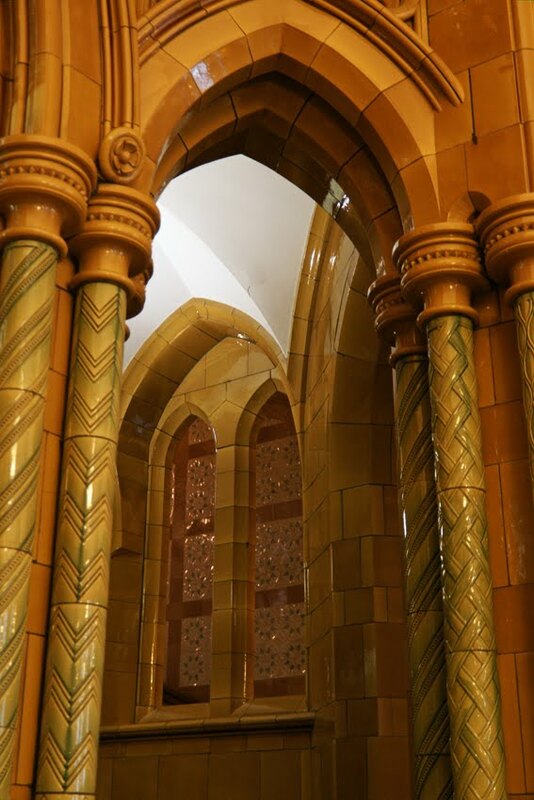 Indeed, the longevity of the park has been considered throughout: not only were materials chosen to last and plants carefully chosen, but a ten-year maintenance plan was put in place and adopted by the Council. This concern for the future was particularly reassuring. There were a number of local people on the tour, and I'm sure we were all pleased that this newly-attractive space should remain so for some years to come. This weekend is London Open House, and in an attempt to make the pace a little more measured I've booked two boat trips this year. However, there will still be plenty of time on foot and here are some SE8 highlights. 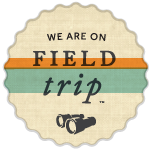 First, two guided walks. I'll be joining the very-local Deptford town centre with BDP. 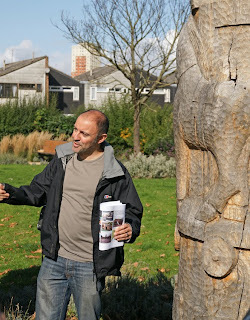 Meet 10am at the eastern entrance of Margaret McMillan Park, Watson Street for a ninety-minute tour of Deptford's recent regeneration projects including the market square in Douglas Way and the park itself. The Stephen Lawrence Centre, Brookmill Road is open 10am to 3pm on Saturday; there are first-come first-served tours at 11am and 1pm. While the Laban Centre - or, to give its full title, the Trinity Laban Conservatoire of Music and Dance - is also open for guided tours, these need to be pre-booked by email. There are also some Deptford homes to visit. 2 Ashmead Mews, a former stable building converted into an architect's home and studio, offers tours every hour from 11am to 5pm on Saturday. They begin with a talk on 'Living Cities, Changing Rooms'. (Access between 40 and 42 Ashmead Road). A short walk away is Connearn Studio, a small artists' studio in a residential garden at 4 Friendly Street. There are regular tours between 10-5 Saturday and 1-5 Sunday. To search over 700 properties throughout Greater London, click here; for a look at some of my previous visits, click here; and for a fascinating glimpse behind the scenes with a volunteer, click here. When you're a successful food-and-drink market, and somebody suggests opening a new food-and-drink market next door, you might feel you have grounds for objection. When you're as venerable as Borough Market, those grounds can be pretty special. any poulterer, country chapman, lader, kidder, victualler, gardener, fruiterer, fish-seller, or any other person or persons, [who] shall sell, utter or put to shew or sale, by way of hawking, or as a hawker, or otherwise, any beef, mutton, lamb, veal, pork, poultry, butter, cheese, fish, fruit, herbs, oatmeal or other victuals, or provision whatsoever, in any private house, lane, alley, inn, warehouse, street, stall, common passage or other place or places whatsoever, within one thousand yards of said Market. It's unlikely that the argument would be legally watertight (after all, you'll find a lot of places including inns which sell food nearby). However, as the market trustees have pointed out, it's a strong indication that Parliament didn't want Borough to get an unexpected competitor next door. Markets have never been able to set up just anywhere and were usually established by charters. Borough Market dates back to the thirteenth century, but was closed by Parliament in 1755 because of the traffic congestion it caused. Local residents raised money and bought a new site (still used today), hence the need for legislation in 1756. 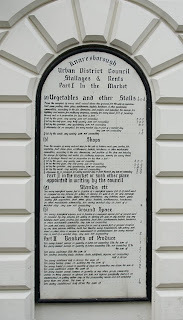 Market rules can seem to be a historical curiosity: the list of fees on display at Knaresborough (pictured) is no longer accurate! 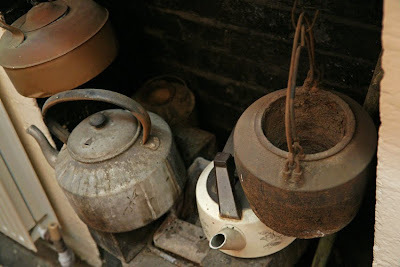 However, as Borough have demonstrated, these ancient provisions are not necessarily redundant just yet. Read the full story of the market dispute on the LondonSE1 website. 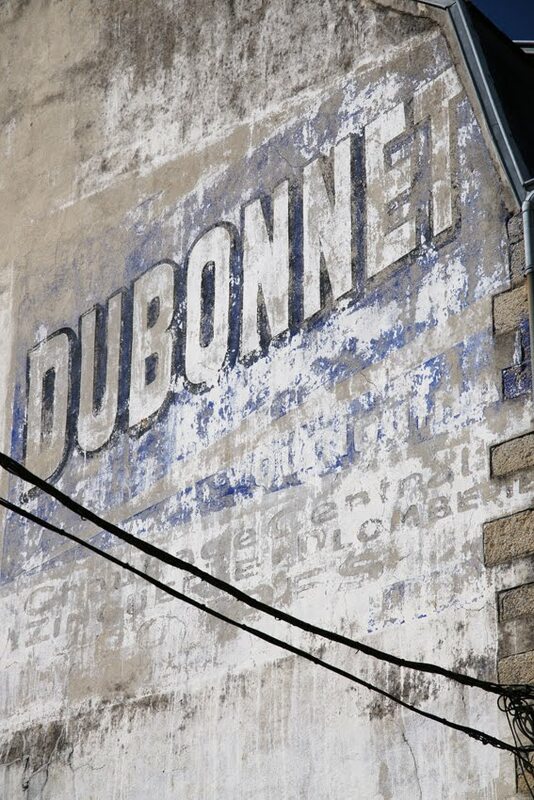 When I began photographing ghost signs in Brittany, Dad was baffled at my interest in bits of old paint. Soon, though, he was stopping the car willingly so I could photograph them, and then asking what they were. Now, he has sent me a sign from Plestan which he spotted and photographed himself. 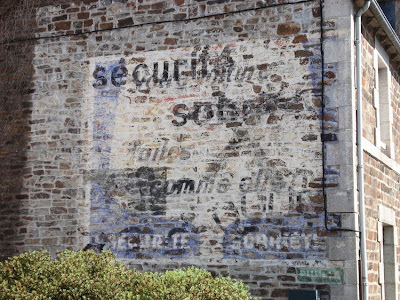 The sign is a palimpsest, but the key message can still be deciphered: 'Sécurité sobriété' (safety and sobriety). This anti-drinking campaign began on Parisian public transport in 1955. Within a few years, it spread throughout France and the roadside signs emphasised the dangers of drink-driving. The earlier advert is a design with a blue ground and a large glass; the slogan is at the bottom. (A similar sign with a different slogan can be seen here). The wording inside the glass reads 'Votre voiture est sobre - faites comme elle': roughly, 'Your car is sober - be the same'. The slogan was familiar to drivers in 1966 [PDF], so this sign probably predates that. Research published that year found that the signs were difficult to read, so either their message was lost or they were counterproductive in terms of road safety! That research seems to have had an effect as the second version is much more emphatic. 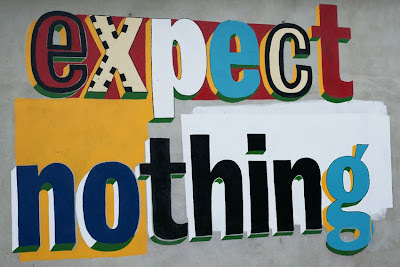 The slogan is emblazoned in heavy black letters across the top of the sign. It appears to be the 'falling glasses' design here, suggesting that the black cross and square also faintly visible belong to a third advert. Altogether, not a bad first find! A reminder that the Lewisham Literary Festival is now underway. I visited yesterday, and enjoyed a really friendly event with the bonus of great cake! There's plenty more on throughout the week, with tickets available on the door; most events are in Hither Green, a short ride on the 225 from Deptford and Lewisham. Particularly London-y events include Fiona Rule talking about Docklands and three recent books on the city in Londonist About London. Unmissable! I love this little newspaper advertisement from 1702, because it reminds us not only of Deptford's manufacturing past but also of the difficult of giving addresses before street numbering. AT Deptford in Kent, is a covered Ropewalk having all conveniences belonging to it to be let, or the said Ropewalk with some Houses to be sold. Information may be had if desired of Mr Tho. Sewel at Mrs Gerrards in Bishpsgatestreet near the Pump at the corner of Threadneedle-street. In fact, the first known street numbering in London was only six years away - in Prescot Street, Goodmans Fields. The idea took off later in the century, with many streets numbered but each in its own sometimes idiosyncratic way. Greater standardisation of London numbers wouldn't happen until the mid-nineteenth century, thanks to the Metropolitan Management Act 1855. It allowed the Board of Works to control both naming and numbering of streets. The Post Office saw its chance to make postmen's work less complicated, and put pressure on the Board to simplify addresses. Although designed to make postal deliveries easier, street numbering must also have been a real benefit to anyone trying to find an unfamiliar building. No longer did they have to follow complicated and ultimately vague directions referring to local landmarks or pictorial signs! As for a ropewalk, it was indeed a place where ropes were made. 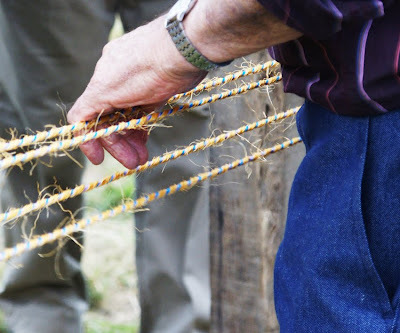 The long, narrow covered path would be used to twist long strands into a length of rope. 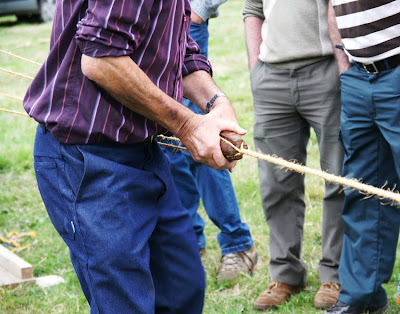 The standard length of a Royal Navy rope was 1,000 feet so the need for a special space is evident - although our ropewalk was probably producing material for private ships. 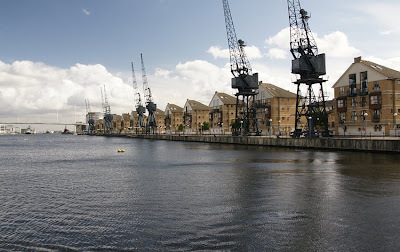 Deptford, as a hub of maritime activity, would have had a huge appetite for the completed goods. 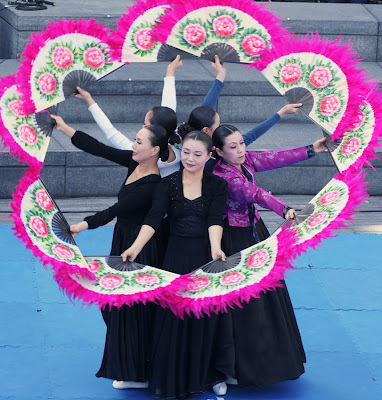 A reminder to those of you in London that this weekend is the Thames Festival. As I found last year, it's very varied with some parts better than others so checking the programme here is a good idea. I'm hoping to visit tomorrow. For now, here are some images from previous years to whet your appetite. 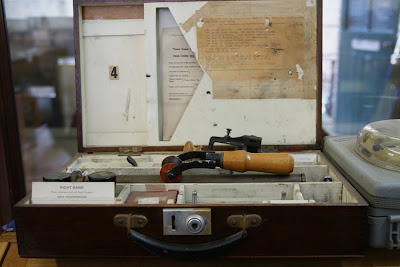 Baker Street has several claims to fame: Sherlock Holmes of course, but also the more utilitarian Lost Property Office. 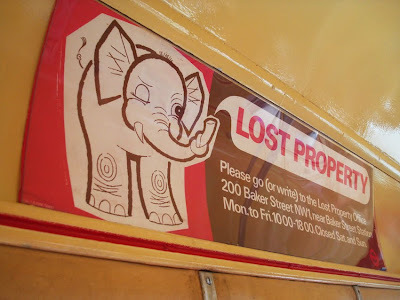 If you lose a treasured possession on London transport, this is the place to go. The Lost Property Office has been reuniting Londoners with their umbrellas and parcels since 1933. If you've lost something, contact them on 0845 330 9882 or online, or visit in person at 200 Baker Street. However, unclaimed items are sold or donated to charity after three months, so don't delay! 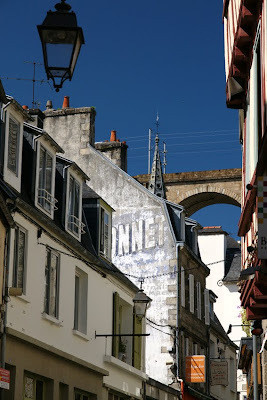 This ghost sign in Morlaix, Brittany is pleasant but unremarkable in itself. 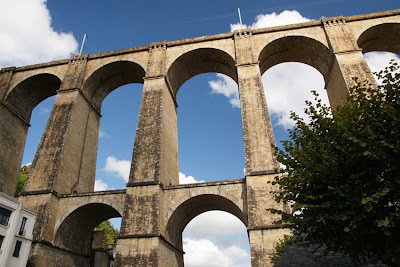 However, its location is eye-catching: a little way in front of the nineteenth-century railway viaduct which dominates the town. There are traces of an earlier sign showing through. 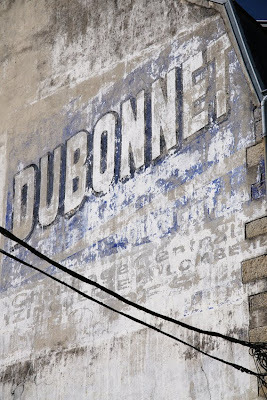 At the bottom, the words chauffage central, zinguerie, plomberie are legible: central heating, pipe or zinc work, and plumbing. 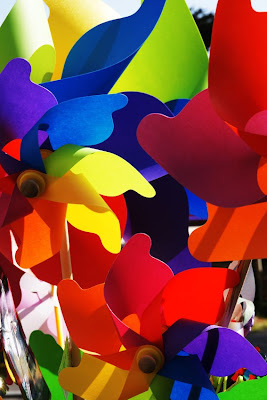 Today was perfect seaside weather in Brittany, which is where I saw these colourful windmills.